On to the Arizona border. The large arch welcoming you to the Grand Canyon state is long gone. But, it lives on in the old black and white "Grapes of Wrath" movie. Stopped by Houck for a visit to the Geronimo Trading Post. Historic 66 is now a frontage road for the Navajo Reservation here. Mostly gravel in composition, but in a few spots, you can still see that yellow double line peekin' through! Just after Houck, 66 broke off and we got back on the Interstate. Right about here you'll pass thru the Arizona Courtesy Station. All traffic East and West stops here. The lady at the gate looked at us and said "Have a Nice Day." Fortunately, she ran out of those yellow smiley buttons about an hour earlier. 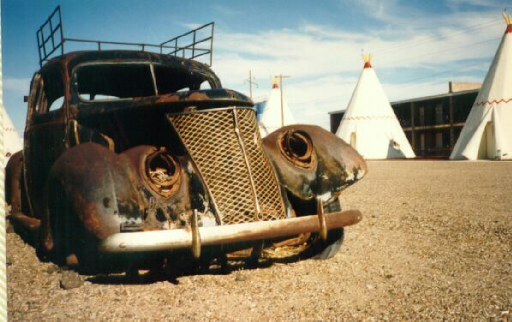 Grab your camera, cos you'll see the Painted Desert and Petrified Forest soon. Beautiful! 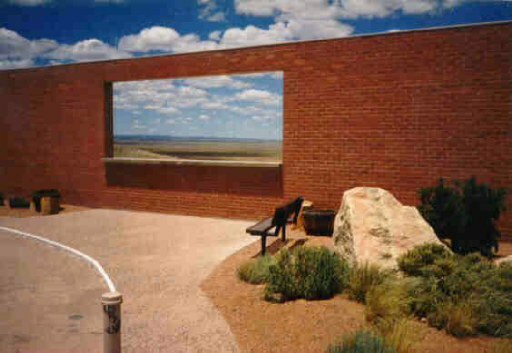 Just outside of the Painted Desert, be sure to stop by Holbrook. It's home to one of the most famous motels along Route 66. Wigwam Village! 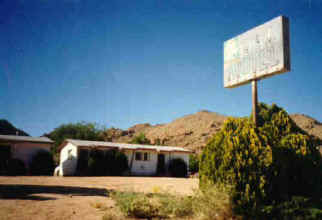 Wigwam Village is a Route 66 institution. Just one of three left in the entire USA. The Village consists of 15 cement wigwams, with all the modern conveniences. It has recently been restored and is owned by the son of the builder. The interiors of these wigwams are vintage cowboy. Having stayed at the Wigwam in Cave City Kentucky as well (the remaining one is in Rialto, California), this place is well recommended! My traveling partner Tim makes a keen and suprisingly accurate observation that about the only thing open in Holbrook after 5 pm is Romo's and the Safeway. Up the next day and off to the Jackrabbit Trading Post. The Jackrabbit is famous for thier large signs of a crouching rabbit, followed by words to encourage you off the highway, lots like South of the Border in the Carolinas. Although the Jackrabbit comes close, I gotta give the tip of the had to South of the Border's mascot, Pedro! Spoke with the owner of the Jackrabbit, who has been there for 28 years. He was kind enough to give us info on a stretch of 66 that we were unaware of. It was just a few miles before Seligman, and it was the Hibbard Road exit off of Interstate 40. Well, we took Hibbard Road and found it to be and outstanding section of the Mother Road. The roadbed of Hibbard was so old that there were plants growing up thru the middle of it. Mr. Jackrabbit had told us that when 66 was decommissioned as a Federal Highway, the "rights" to the road reverted back to the state. If the state decided not to maintain the road, then it reverted back to the owner of the land that the road ran thru. Well, back on the road towards California, and we then stopped in to see Meteor Crater. NASA used this area years ago for astronaut training, due to it's close to the moon as you can get on the earth's surface, I guess. Remember the movie "Starman"? It was filmed here.